''What is the role or the importance of the music you created at Sun in today's music scene or even in our current social climate. ''I'm not trying to be immodest or modest, I'm just stating a fact as I know it: the music we created was a threshold on which all of rock and roll, in my opinion, is now based. Now I don't mean that we did it alone, because there was other people that was doing other independent labels that were working hard at this. The thing is, I tried my best to make it a bridge between white and black. Now keep in mind, I had recorded the blacks from 1950 until '53 almost exclusively, and after Elvis, I really did not record as many blacks. I have been accused of showing partiality to whites, which, of course, is absolutely diametrically wrong''. ''The patterns were set there at Sun and people have since come along and done some amazing things with 'em. Now with the idea in mind, I focused on that simplicity and sounding natural. 'Saying what you mean' and doing it without the assistance of a 'written speech', to me, is kind of synonymous with somebody coming in and doing their music ''off of there cuff'' or out of their head and out of their heart and out of their experience''. ''I realize that there are groups and bands and everything that have predetermined arrangements, but the basic rhythm and the basic approach to music today is still a lot of stuff that does not have the canned sound. I think where we are losing some of the edge of the early feel and intimacy of music might be in the extreme ability not to put everything on a separate track and to overdub and overdub. Certain types of echo are just unforgivable as far as I'm concerned, and I think we substitute too much of the mechanics and the ability to do things electronically for the pure raw feeling of the music itself''. ''How did you match up the different session musicians with the main artists you are recording in order to create this raw feeling or natural sound''? ''I tried to use as many self-contained bands as possible. In other words, if there was a little group that played together quite often, whether they ever played together that much commercially or not it really didn't matter. I encouraged this... I think that if I have any talent at all, it's that God did give me a good set of ears and I knew what to do with them, so consequently, getting the people for the sessions was not a big responsibility for me because it was a type of thing that I instantly knew whether or not we were gonna get a feel with what we had''. ''And I might add that I never augmented where fewer would do. I always liked the simplicity of what I could do with a very few instruments and somebody that had what I thought was talent in the rough''. ''The more successful you and Sun became, you still stuck to the notion that simplicity was good and that it was enough to bring out the best in those artists''. ''Absolutely. That was the show as far as I was concerned. Still is..
''Do you feel like there was a kind of magic in the type of equipment you were using then compared to today's equipment''? ''No, I think it's the people that use it. I would say that the sound and everything that you can get now is much better. Everybody thought, well, if you had the old vacuum tube type verses the solid state, it would make a difference. No, it is the individual. We get cleaner better sounding records, there's no question about it, but that is even more the reason why you shouldn't try to doctor these things up too damn much. I mean you can put down what comes out of that distorted guitar if you want it, and you should, but the thing of it is that people tend to mistake hi-fi for clear big sound and all of this BS and when you get into that, I mean that's all right, that's good sound, but now what does it contain? You know? I mean what is the essence or what is the message, even if it's an instrumental, that you're getting from that? You know? If you want to hear a fifty piece symphony orchestra or seventy five or a hundred that's great. But if you want to hear the guts and the balls of what's really there, you can do it absolutely better, in my opinion, with the technology that we have today provided that we don't abuse those technologies and substitute that technology for the heart and soul of what music's all about''. ''How much of the Sun phenomenon do you think was the social climate at that time, such as with race relations? Or how much of it was the right people, who happened to be in Memphis, coming to you at the right time''? ''I think that basically people were stunned that I opened a little studio, and of course, I couldn't borrow any money or anything from anybody to buy a piece of equipment or anything else. I mean you could classify me as the town idiot and probably not be far wrong; but I had a different notion''. ''I was doing the Peabody bands, of course, here at the Skyway and loved every night of it... and I loved country music, what was coming out of Nashville. But I also knew what was available out of the Delta... I had come through Memphis in '39, a long time before I even moved here in '45. I fully intended to record blacks for as long as I thought I could and then convince people that we could actually cut hit records on black people''. ''Now the reason that I say that is, you have to keep in mind there was very few stations, even as late as the middle fifties, when I was mainly recording whites by then, but there was very few stations across this country that was playing black records and getting the airplay and exposure that they needed, whoever they were, black or white. So I had certainly considered, was this a wise thing for me to do? But I knew that I had to try it and that I was going to and there could not be a place in the world better than Memphis, Tennessee, to use as a laboratory''. ''The point that I'm trying to make here is that black people who came to my studio, early on, did not believe they was gonna get out of that studio without being hit with a bill, Ok..''? ''Oh man, but I'll tell you, it was a thing back in those days, and once they knew, when they didn't believe it when you told 'em – that it was not gonna cost ém a penny for an audition and that I would take the time necessary, and if that wasn't enough time on one trip, if I thought I heard something that I might be able to do something with, we would set up a time... We did, whatever was necessary once I felt that I had heard something that we could do something with. I was honest totally with 'em''. ''My relationship with black artists began just like it did with ''Rocket 88''. I can tell you unequivocally, that damn record was in a way an accident because a damn amplifier fell off of a car on the way from Clarksdale up here and busted all to pieces, and we had to rig up that guitar amp in order to go ahead and have a session. So I did that, and I came up between Raymond Hill's saxophone and Jackie Brenston's saxophone and this busted guitar woofer, and we came up with a sound that was unique''. ''The whole thing boils down to this: I made as many mistakes as anybody in the world; I was honest with black people and white people; I tended to be very partial to people that were underprivileged – both black and white; I tended to not want to spend my time working with somebody who, was, already having success''. ''Later on, I was requested by very dear friends from people in Nashville when they'd cool down a little bit from having hits – to use as an example Webb Pierce, he called me and wanted me to record him. I said, 'Webb I can't do you any good because Nashville does great with what it does and I do what I do', And he said, 'That's precisely what I want you to do'. I said, 'Well that is not a challenge. I love you, but I don't think I would be of any value to you'. All my total life, I guess, has been devoted to the unexplored. That's the only thing that interests me. I realized the gamble there, but I was willing to take it in order to satisfy an emotional feel that I had for life''. ''Looking back now would you have done anything differently''? ''Oh, I'm sure I would have done some things differently, but I don't think they were of any great significance. I think my approach to what I did was an emotional thing or nothing would've ever happened; that involved dealing with the people individually, collectively, and dealing with the crackpots in the studio, so to speak, and relaxing the musicians and making them feel at home and at the same time making them feel like they was fixin' to come out of the damn gate''. ''What do you think about Beale Street today and the tourism industry that's grown up around the music you helped to create and record''? ''I think it's absolutely great. Of course, you will have some resistance, and I've heard that some blacks say, 'Well they're trying to capitalize', and you know how that goes. And some whites say, 'We don't want to have this', but that is so minuscule today. The spirit of Beale Street is there. I've been here and I saw it in it's heyday and I saw it when it was nothing but a ghost street''. ''You can walk down there right now and see blacks and whites enjoying what is there, and I don't know of anything, anywhere in the country and maybe in the world that is more enjoyable than going to Beale Street any night of the week. There is any atmosphere and a feel right down there now, not just in the daytime, but anytime of day you want to go that is absolutely fantastic. I guess it's because of us that knew it before and saw what it went through that see it today and say, 'Yes sir, there is such a thing as ''reincarnation'', but maybe with a dress or suit or something that's a little bit different''. ''The whole heart of Beale Street is there, I'm sorry. I thank God that people don't have to starve to death on Beale Street like so many of us did back in the days when, I mean times were hard, Depression days, 1929 through, well, to the beginning of WWII''. ''Do you keep up with much modern rock and roll''. ''No, I really don't follow it as much as I would like to and the reason is that I'm a very active person. I don't know that I get a hell of a lot done, but it sure takes me a long time to do it. I think that young people can do just as well as we did on it, I just hope that the motivations and everything of the big record labels, because there are not many independents anymore. I hope that the double bottom line of all the vicepresidents and the boards and all of his stuff is not just to listen to the almighty dollar. Let ém make all their money, and they're doing real well with that, but let's don't forget what the true basic meaning of music is and that is – communication''. ''There is absolutely nothing like music. I say that after many, many years of just about being on all sides of it. I tell you right now, if I had to give up my sight or my ears, I damn sure would give up my sight first as long as there's music around. If the world was silent and there was no music, I'd say give me my eyeballs and I'll go from there''. ''You talk about going with your gut and that type of thing. What's the most important thing, especially for a young person, to look for or understand in order to try and do something a little different? How would you advise people about the spirit of individualism''? ''It's different with each individual and each circumstance but in a general overall category. I think the greatest asset that any human being can have is to believe in something and don't be hard-headed and say, man, just because it doesn't seem to work that everything else is wrong''. ''I could not have lived with myself had I not did what I did. Let's say in the early days it fell flat for whatever reason. I knew I had to hold on a while. You must have the attitude that, look, I want to give myself as completely as I can into something that I truly believe in''. ''There is nothing in this world greater than somebody having the conviction of something and trying their best and giving it their all. If you don't believe that that will keep you absolutely with a sharp mind and a sharp idea about what's going on around you, try it and just fail a little bit and you'll see how much you have learned. It is a great asset to live in this day and age and I just wish I could run the clock back or the calender back 'cause I would be right back, head first in the music if I was a young person. I would be in the experimental stuff. I don't give a damn what anybody else was doing I would be doing something different''. ''I am not careless at all in advising young people to just go crazy. That's not it. And so what if you make a little mistake. I had so much responsibility on me with my family and no father and an older mother and a deaf-mute aunt and two smaller children and a wife and you know, hell, so what, I was still luckier that a hell of a lot of people. Don't be afraid to follow that dream. I mean just don't be afraid to do it''. ''I'm being honest with you, I don't know where you're from, but Mississippi was one of the greatest states in the Union to understand what was going on at Sun as evidenced by the people and the music that's come out of the state. So it's highly appropriate that they want to put up with me down there and I'll let 'em ask me a couple of questions''. 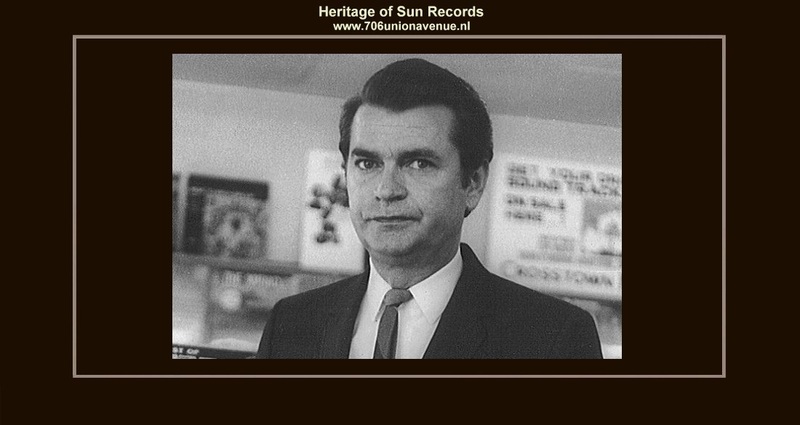 ''Everything Under The Sun'' interview with Sam Phillips founder of Sun Records by Stanfield Gray, Music Editor ''Oxford Town, issue October 16 to 22, 1997.